This is Kristi Ann Hunter's second book in the Hawthorne House series. After reading the first, A Noble Masquerade, I eagerly anticipated this release! I had a chance to read it last week and fell in love all over again with Hunter's writing. Here's the blurb and we'll chat on the other side. While this is a series, these books can easily be read as stand-alone titles. However, because I'd been introduced to Lady Georgina and Colin McCrae in the first book of the series, I was already invested in them before I even opened the book. I love the way Hunter marries serious scenes with lighthearted ones, allowing the reader to see the many sides of her characters. One small drawback I felt to this book was it began with scenes from The Noble Masquerade only in Lady Georgina and Colin's viewpoints. And while this is completely a new story, at times--for those who read the first book--it seemed we were peeking behind the curtain of The Noble Masquerade rather than truly seeing Georgina and Colin's story. For me things didn't fully pick up pace until we moved from those scenes into completely fresh ones, allowing these characters space to grow and challenge one another in new ways. Though I did like understanding Georgina's motivations and I loved her even more for her flaws, I would have loved for the entire story to be their own. Hunter is an author I now search for in anticipation of her next release. 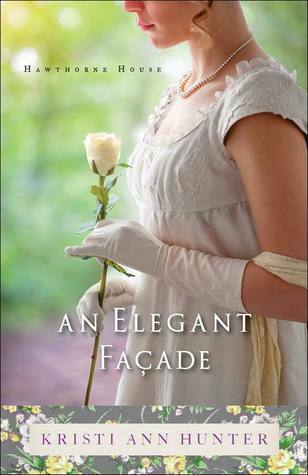 I happily give An Elegant Facade 4 out of 5 stars and you can purchase it here. I thank Netgalley and the publisher for my copy of this book in exchange for my honest review.